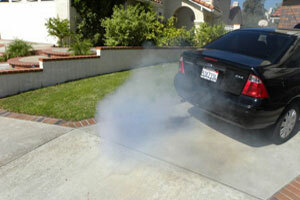 You are here: Homepage» Articles» HOW TO ASSESS SMOKE COMING FROM MY AUTOMOBILE? Smokescreen… My ENGINE smokes! How to assess smoke coming from my automobile? What Causes a Car Engine to Smoke? What does it mean when your car motor is smoking? Engine smokes? This is a bad sign, but commonly reparable. Exhaust coming from your vehicle's tailpipe should be clear. If you see smoke coming from your tailpipe, pay attention to the color of the smoke; you can use it to troubleshoot engine problems. 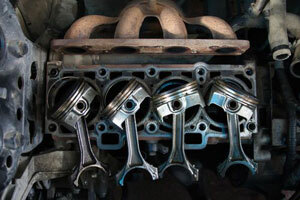 It can tell you whether you have a leaky gasket or give you hints about your air/fuel mixture. To begin with, let’s see what the fumes are and what they are associated with. The color of the smoke can say a lot. Black smoke, especially from diesel engine – the reason is fuel. It is associated with disorders of the fuel combustion. There are several reasons for that. Deterioration of fuel equipment, violation of its regulations, and poor-quality fuel, coking of the nozzles and blocking of the needle in the shut-off nozzle. More often, all this is accompanied by the power loss, the deterioration of the start motor. But, after repair and adjustment of the fuel equipment, the prognosis for the patient is usually favorable. 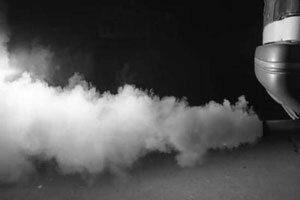 Engine smokes white smoke - it is almost always associated with the contact of the coolant with the cylinders. This is a very bad sign, meaning you cannot do without dismantling. The coolant can get into the cylinders only through the seal gas joint, and its appearance there is usually associated with burnout or cylinder head gasket, or the deformation of the bottom plane of the head. Here you can’t escape a serious overhaul. Do not postpone it - you can reach the water hammer, and even then, the repair won’t help. This defect will never disappear by itself, it can only progress rapidly. But the blue-gray and gray smoke is associated with the combustion in the cylinders of the engine motor oil. There are also several reasons. To ensure that the oil is burned, it must first enter the combustion chamber. There are only two ways for its penetration principle: through the piston seal below and through the valve upper. When oil leaks through the valve it is usually associated with wear and tear in pairs "valve-rail" where the gaps are growing, and with violation of the valve stem seals. It is treated during the repair with replacement of all defective parts. But with the penetration of the oil from the bottom you can fight without disassembly. First you need to figure out why it goes into the cylinders. There may be several options. First, the increase in oily fumes may be due to the wear of parts of the cylinder group (CPG) and the deterioration of the quality of the seal. Oil leakage into the combustion chamber is regulated by the oil rings and partly by the gaps in the CPG. In the wear process sharp scraper of the ring become worn down, the surface pressure is reduced and they begin to let the oil leak to the compression rings, and to the surface of the cylinder, with the greater amount of oil. And it burns, forming oily smoke. A similar effect is produced as a result of accidental overheating of the engine - but in this case, with almost unworn ring, heat is released, and, therefore, loses its elasticity, the spring expander ring. By the way, this is the most vulnerable link in the engine, which is the first to suffer from accidental overheating of the motor. There are no options - only repair! If the rings are left intact, but the engine smokes because of CPG wear, you can try to improve the situation by treating it with ATOMIUM. Let us explain why it can help. Wear of piston assemblies are usually accompanied not only by the growth gap (just to increase to a certain extent by the elastic piston rings), but also the formation on the surface of the so-called friction defects - scratches, dents, each of which acts as a kind of "oil pocket", accumulating a certain amount of oil. It is, and remains lit when the corresponding part of the cylinder surface is exposed to the hot engine fumes. ATOMIUM treatment leads to the elimination of these "pockets", and therefore reduces the amount of oil that is prone to loss in yarn. And alongwith it comesback to normaltheopacity ofthe exhaustgases. The most common cause of increased oil consumption (to loss in yarn) and as a result smoking of the car is a ring sticking. Usually this is due to the accumulation in the area they are located on the side of the piston temperature deposits, "sticking" or "wedging" the rings. They lose their ability to seal, oil freely gets into the combustion chamber, dramatically increasing oily fumes and smoke. The problem of dealing with this defect is obvious - just release the ring, removing deposits from the surface of the piston in an area of the rings. ATOMIUM can perfectly cope with this task. This lubricant at the initial stage of its work, prepares the surface to form a protective layer, removing deposits. The cleaning ability of ATOMIUM is very high and therefore it is able to eliminate this problem. Besides, the processing engine with ATOMIUM lubricants you can carry out your own diagnostic actions. We have seen cases where after the treatment opacity of the exhaust gas increased. This is normal reaction on the early stages after treatment - all that removed dirt burns. It is washed by ATOMIUM from the working surfaces of the combustion chamber. But if the opacity doesn’t improve shortly, it means only one thing - motor damage is already so high that only repair with replacement parts can help. Oily fumes and smoke at such motor kept those deposits on the surfaces, they reduced the gaps. After the treatment ATOMIUM lubricant washed them away, and the gaps have increased so the leakage of oil also increased further. Nothing can be done here - ATOMIUM is not a panacea that can raise the dead, we always warn about it. So the problem of increased engine oil smoke is solved through the initial diagnosis. Some of these problems described above, are solved only by repair or adjustment of the engine. But when the reason is the oil, then in most cases the problem can be defeated using ATOMIUM range. And what is more correct - do not bring the situation to the disease, work on the prevention! Correct and on-time anti-friction anti-wear engine processing will give the greatest effect if you want to prevent the smoke.